INSPIRE THE COOK WITH A NEW KITCHEN LOOK! There are some hilarious phrases on the internet pertaining to why someone doesn’t necessarily share the joy of cooking such as “My favorite thing to make for dinner is ‘reservations”, or “This evening’s forecast includes 0% chance of me cooking.” Perhaps these humorous phrases were inspired by homeowners who weren’t inspired by their kitchen. To create, one needs to be inspired; and when you have a kitchen you love, you’ll love to create in it! Today’s kitchen designs are definitely filled with inspiration, as there are so many amazing design options you can choose from! The kitchen is not only the most frequented room in the house, but it’s become the focal point and the heart of the home. This is where families and friends gather and create not only meals and conversation, but everlasting memories. 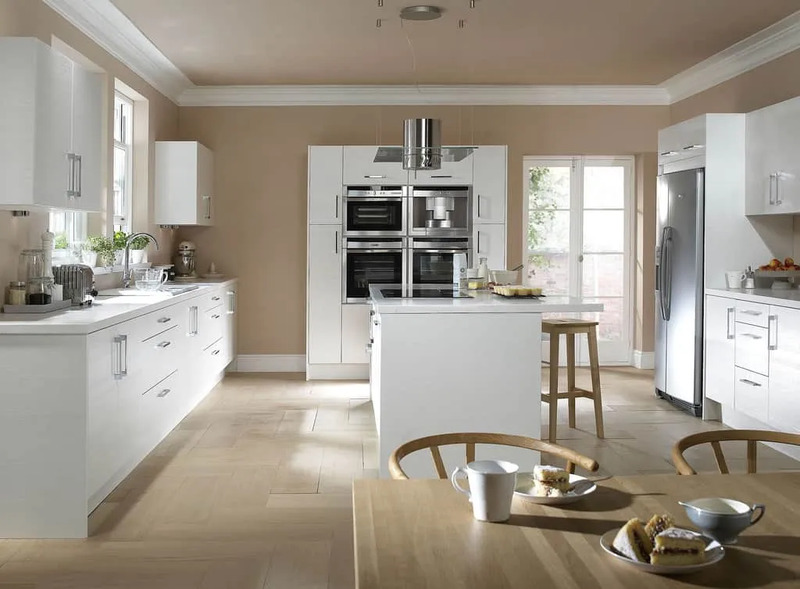 Whether your new kitchen design will reflect the rest of your home’s theme, or vice versa, you can create a dream kitchen in a style that truly expresses your personal taste. GI Construction, your general contractor in Las Vegas will help you create the kitchen you’ve always wanted–from the design phase through the finishing touches–our wish is your command! As we mentioned there are endless options when it comes to kitchen remodeling, but here are 10 styles to get you started! Classic kitchens are timeless, yet certainly not old-fashioned. Though often creamy white cabinetry is notorious in a classic kitchen, introducing neutral colors–such as shades of gray or browns, and especially black & white combinations–are alternatives that work wonderfully. The cabinet door style defines the classic look with a simple shaker door (recessed center panel) with or without bead moulding. You will rarely see raised panel doors (found in traditional kitchens) or flat-panel doors typical for modern kitchens. Subtle details such as legs on kitchen islands are common, as are furniture-style toe kicks, paneled range hoods and crown molding. Countertops in a classic kitchen usually have a soft honed finish, as homeowners desire to create an aged or casual look. To create a soft honed black countertop for instance, the polishing finish ends before buffing to create a matte or low-gloss product. White marble countertops are also very popular in a Classic kitchen. Marble requires more maintenance than quartz or granite, but its beauty is often irresistible. 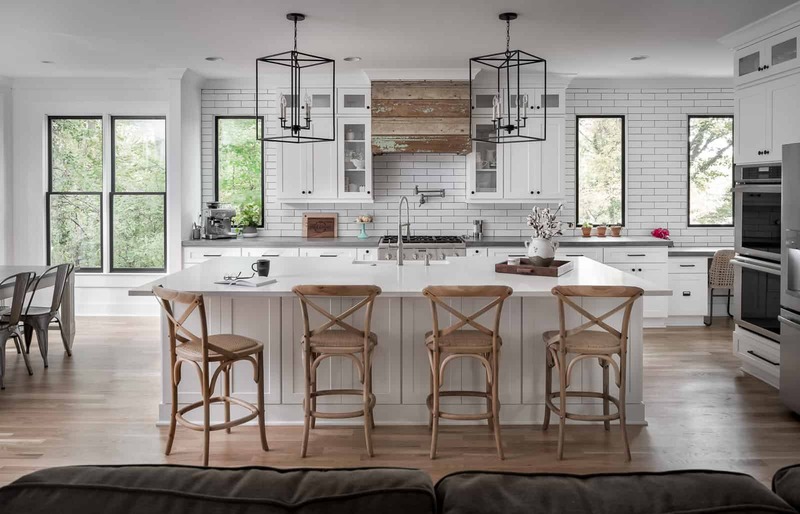 White subway tiles for backsplash are prominent in Classic kitchens; however, gray shades with white grout or black tiles with white grout are also favored–as are patterned tiles. There’s also nothing wrong with going with a soft color for your backsplash—such as a seafoam green. The exciting thing about Classic kitchen designs is their flexibility and ability to incorporate other styles. For instance you can mix in an industrial look with table & chairs, bar stools, lighting etc. Or mix in traditional accents–such as an ornate hood and an island with turned legs. Classic kitchens can be rustic and country as well with exposed beamed ceilings. With Las Vegas kitchen remodeling a Classic kitchen design can be yours–if you can imagine it, you can create it! There’s something about the words “home sweet home” that just seem to describe a country home with a Farmhouse style kitchen. Many of us living in Las Vegas came from other areas around the country where “home sweet home” was this incredible room filled with treasured memories. Perhaps it was your grandparents home–perhaps your parents–but the best part about it was that spacious, warm & cozy kitchen that was always so welcoming. To recreate this look for your kitchen, you might consider removing the doors from your cabinetry to expose tableware. In a classic Farmhouse kitchen, open cabinetry was about simplicity and function–but also about displaying your best china for everyone to see. If you wish to have the cabinet doors remain, incorporating glass will add sophistication for a more classic look while still keeping the farmhouse charm and showing off your china! A vintage stove and hood in a Farmhouse kitchen can be a huge focal point, as can fireplace. Nothing makes a kitchen feel more inviting than a cozy fireplace. If incorporating a fireplace isn’t possible, you can recreate the look by purchasing an electric fireplace in this style and creating a brick surround and mantel for it. Accent with vintage period pieces such as old pitchers, pottery, clock etc. A Farmhouse kitchen with wood floors is most common, yet you can always go with other materials that resemble wood. If you are a little more adventurous, black and white tile or checkered linoleum can work as well. A Farmhouse kitchen may incorporate a large wooden table with turned legs as an island. This surface would allow for multi-tasking for food prep, serving, and dining. Or perhaps the table island designated for prep and serving only, with a built-in dining nook in another area for family meals. There’s nothing that shouts “Farmhouse kitchen” more than an apron-front sink. This vintage style sink embodies the style of a modern farmhouse and is composed of a sturdy, deep bowl that stands up to heavy-duty kitchen use. Many new designs are on the market today, but you can also find vintage models from salvage yards, swap meets etc. If you need more cabinetry for an overflow of pantry items and have the extra space, a free-standing cabinet is always a great look to add to a Farmhouse kitchen design. Try painting it a different color than the rest of the cabinetry and choosing one that is more furniture-style detailing will also give it the farmhouse effect! Open and inviting, a Farmhouse kitchen has a comfortable, lived-in look that is a feel-good atmosphere for everyone to enjoy! With GI Construction as your general contractor LV, remodeling home improvement for a Farmhouse kitchen is just a simple phone call away! Kitchen cabinets in Las Vegas are big on the Modern kitchen design which is known to be sleek and sophisticated and designed for a clean, elegant-simplistic appearance. Modern kitchens have reflective surfaces and high-tech materials, along with extraordinary woods that contribute to this luxurious design. Frameless cabinetry without ornamentation, simple hardware, and strong horizontal lines make up a Modern kitchen design. The emphasis of the horizontal lines is in the entire makeup of the kitchen that focus on long, wide lines, stacks of drawer cabinets lined in a row, hardware set horizontally–running the full length of the drawers to complement the drawer lines. Cabinets have horizontal grooves in addition to the grain being horizontal on the cabinet fronts. Although the cabinetry is sleek, the natural beauty of the elements are beautifully exposed. The simplicity of the hardware usually consists of C-channel pulls, tubular pulls or flat linear pulls that are integrated into the cabinet. Any ornamentation in a Modern kitchen usually comes from the natural characteristics in the material, such as the horizontal grain of wood or natural beauty of the veining in marble. A Modern kitchen is appealing to those who prefer its minimalist-sleek look, and the efficiency while tasking in the kitchen. The clean, linear theme is present throughout, and makes for a perfect design for those who love the modern-age look! When picturing a Traditional kitchen, family gatherings with friends in celebration always comes to mind. 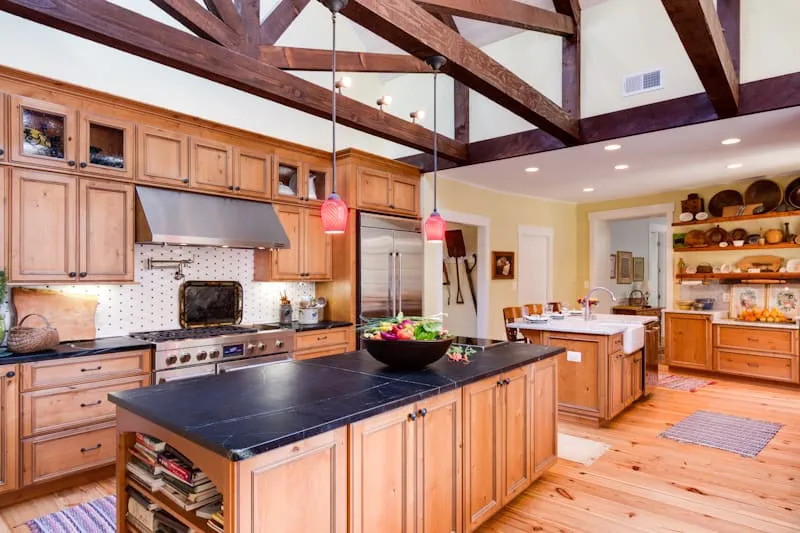 The Traditional kitchen is most welcoming and comforting with its arches, decorative moldings, antique finishes and furniture-like details throughout. You might even find a chandelier above adorning the room with it’s soothing light. A Traditional kitchen may lean more towards a classic American style or old-world feel–either way, they present the owner’s personal taste and creativity. Traditional kitchens focus on wonderful eye catching details in all areas–such as arches (from doorways to decorative niches), moldings, box beam ceilings, framed and raised-panel cabinets, glass door cabinets, custom hood surround, chandeliers and vintage light fixtures, furniture-style floor cabinets, islands with turned legs, icebox hardware and more–all contributing to the beauty of this timeless style. Cabinetry construction in a Traditional kitchen has a very important role. 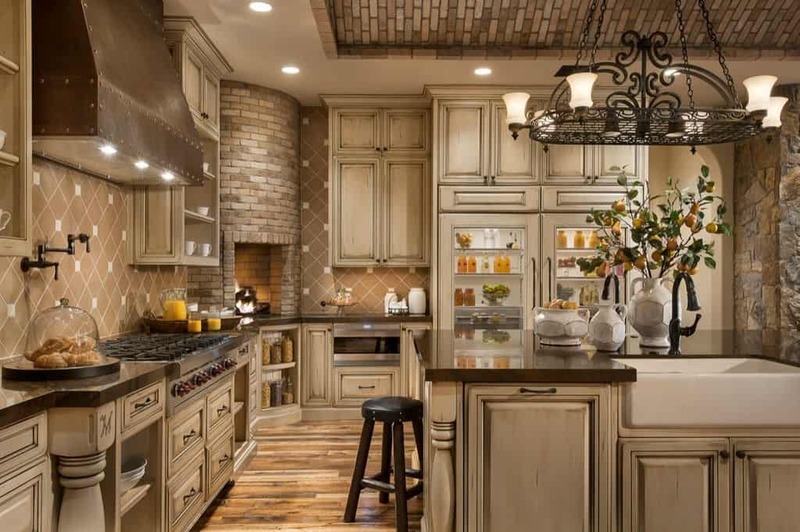 Where Classic kitchens feature shaker doors, Traditional kitchens will feature more ornamentation with raised-panel doors, as well as glaze finishes that present an old-age distressed look. Traditional kitchens will also use multiple finishes such as one color on the cabinet and another color on the island. Mixing finishes adds to unique feel of this kitchen. Cabinet doors have many beautiful variations–such as glass with a beveled outside edge, wood mullions in different arrangements, metal mesh inserts, antique glass and more. Traditional kitchens feature ornamentation with decorative moldings and corbels, legs and pilasters on islands, and furniture-style toe kicks. Custom wood hood surrounds that resemble fireplace surrounds are prominent. As in Classic kitchens and Farmhouse kitchens, an apron-front farmhouse type sink is a signature element that embodies the style of a Traditional kitchen. These sinks are a fabulous choice both aesthetically and functionally. The old-fashioned character makes these sinks unique and popular to many homeowners wishing to remodel their kitchen. In Traditional kitchens you will see many luxury countertop materials such as marble, walnut butcher block, quartzite and granites. Opting for marble can result in more maintenance than other countertops, but the beauty of marble–especially calacatta and statuary marble– has an old-world feel that is simply stunning. Man-made quartz materials can simulate the look of marble should you prefer something easier to maintain. Honed finishes on countertops seem to be featured more than polished stone countertops. Lighting that you might expect to see in your dining room or foyer–such as chandeliers or lantern style lights— is featured in Traditional style kitchens. This is trendy in that it creates an atmosphere of a living room rather than a utilitarian space. Small, unexpected details are naturally found in Traditional kitchens. Niches behind the stovetop, behind the sink, or flanking the stovetop are some examples you will find that add to the beauty and uniqueness of this stunning kitchen. Free standing cabinets that look more like furniture are another popular item you will see. Hutch cabinets are often thought of as dining room furniture, but show up in kitchens with their individual beauty. They add extra storage as well as providing unique alternatives to appliances as some homeowners have them built to even host their refrigerators. The contemporary or “present-day” kitchen typically means “the design of today”. With a cutting-edge design and technology consisting of high-tech appliances, state-of-the-art storage, new trends and materials, a Contemporary kitchen is perfect for homeowners who like to stay busy in the kitchen. Like Modern kitchens, Contemporary kitchens tend to also be very sleek and stylish. Contemporary kitchens, however, allow for more flexibility by incorporating elements from other styles-such as traditional and industrial accents. The Contemporary kitchen expresses functionality and excitement as a room where both hosts and guests work together, interacting to create delicious cuisine! The beauty of food prep and presentation all comes together in this comfortable and spacious setting. A Contemporary kitchen is known for its multiple layered materials–such as natural or painted woods, tile, metal and glass, various shapes, and plenty of patterns and textures. Cabinets may have a mix of finishes and countertops multiple materials. Unlike Modern kitchens that are inclined to be more restrained and lacking in ornamentation, Contemporary kitchens embrace these features and ornamentation is welcomed. Today’s Contemporary kitchen will take advantage of new technology that allows the kitchen to be more efficient. Sleek and trendy high-functioning electronics, updated accents & accessories and cutting-edge appliances make their way into this kitchen design. High performance hoods, induction cooktops, built-in coffee makers & microwaves are also favored. Under-cabinet lighting is another feature that is prevalent in Contemporary kitchens. Glass, mosaic, ceramic and stone tiles are popular on backsplashes which express the personality of the homeowners tastes. Contemporary kitchens are unique in that they blend both style and function to create a space that is both cutting-edge and welcoming. A Tuscan/Mediterranean kitchen has old-world elegance, and if you could describe any room outside of a bedroom as being “romantic”, it would surely be this kitchen style with its warmth, beauty and charm. This European-influenced style is drawn from French country chateaus, Tuscan and Italian villas, Spanish Mediterranean homes, and appreciated by homeowners who adore all the elements that make up every detail of an Old-World kitchen. The Tuscan/Mediterranean kitchen is warm, inviting and saturated with rich, warm colors and ornate details that pull from sun and sea, bright foliage, and elements of the vivid landscape of these beautiful regions. The signature look most always begins with a Saltillo floor tile for an earthy feel that goes perfect with the warm palette of the entire room. Exposed beam ceilings providing a rustic feel that blends with iron work and textured walls, hand-painted tile work on a backsplash, island or above the range, and intricate dark wood cabinetry are also signature features in this stunning kitchen design. Arches are common in doorways and in other areas such as cooking alcoves. Wrought iron detailing provides beautiful accents throughout the room, such as an iron pot rack above a large kitchen island for a dramatic touch. Walls are textured with stucco, drywall or Venetian plaster and echo the sense of an old-world villa. Open shelving and hearth structure over the range are also expressed in this beautiful design, as are iron, bronze and copper fixtures and sconces. While various elements of old-world designed kitchens are heavy and dark, blending in moderate accents of reds, yellows, blues, greens, oranges, or lavenders breathe life into the room for a beautiful romantic atmosphere! Rustic kitchens have become increasingly popular as homeowners today find the beauty in these trendy distressed designs. A Rustic kitchen breathes comfort and peacefulness, with elements that create a homey feeling to make up this unique “rough hewn” style. Elements that show their age, worn timber beams, slate floors, distressed cabinets and farmhouse tables and islands contribute to the Rustic kitchen look. Farmhouse or reclaimed sinks are signature in a Rustic kitchen–soapstone, copper, bronze or stone–and even variations of stainless steel are popular. Architecture is key as well–such as stone walls, wood ceilings, exposed beams, and brick archways. Top it off with a fireplace and your in serious Rustic kitchen business. With a Rustic kitchen it’s definitely about the wood. From the floor to the ceiling, you can’t help but relish in it. Breaking it up with different materials for your countertops and backsplash will add contrast and definition. Accenting with colorful runners, copper pendants and adding colors around the room–such as dark wood on your island top with a burgundy red paint for the base. Vintage touches such as an enamel stove reclaimed or antique hutch, and old fashioned cabinet latches add to the rustic charm. Consider painting with a rustic wall treatment to give the illusion of texture and age. A farmhouse table is always fabulous, but a cozy alternative is a built-in breakfast nook. Dress up the dark wood seats with some colorful cushions and artwork on the wall surround. When it comes to creating a Rustic kitchen, there are endless home renovation ideas. From weathered beams to stone floors to farmhouse tables and sinks and painted cabinets, this style of kitchen everyone can embrace–whether in the country or city, small kitchen or large, rustic beauty is always a winner! Eclectic is without a doubt one of the more difficult styles to pull off, but can truly be one of the most rewarding. One of the reasons Eclectic kitchens are so beloved is the way they blend not just styles, colors, textures and time periods–but to the homeowner–it is their masterpiece–an ever-evolving work of art. Diving into conceiving an Eclectic kitchen definitely requires plenty of creativity and the ability to accept that it will be a trial and error experience. 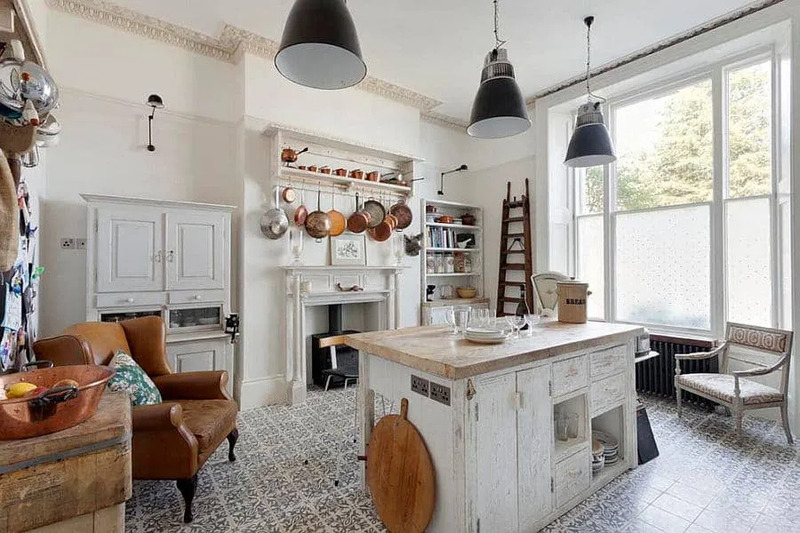 The Eclectic kitchen is a decorative blend of past and present, modern and traditional, minimal and industrial, contemporary and classic all contributing to this exciting magical space! When you are ready to go down this path and create your own Eclectic kitchen, remember that the perfect balance for this design doesn’t have to be achieved in a large space. When done right, even the smallest kitchen will come alive and light up the entire home. Looking for all the pieces that fit together almost like a jigsaw puzzle is fun and exciting! You can find interesting space-saving elements and versatile cabinets for functionality and performance in your kitchen. Floating shelves, convenient drawers and cabinets all contribute to helping you achieve your goal! Have fun with a kitchen island, as an Eclectic style allows you to choose any design that floats your boat. Choose the finish and material to compliment the cabinets and shelves to complete your look. If you love color, going eclectic is of course challenging, but definitely an exciting experience! You can accent in endless ways and tie everything together for an amazing focal point of your home! Take your time and enjoy the journey of masterfully mixing time periods and styles and shaping a kitchen that shows your true personality. People who chose to have Eclectic kitchens are usually bold, creative people who like to have fun. Ignore the rules, be a rebel with a purpose, and create that kitchen of your dreams! Craftsman kitchens are filled with rich woods that defines Craftsman style and emphasize a natural beauty throughout the entire room. They are comforting and welcoming as being home for the holidays and gathered around the fireplace on a cold winter’s day. Craftsman kitchens are popular for their clean lines and rugged character and display incredible woodworking and craftsmanship. Craftsman style cabinetry is literally amazing–clean-lined and straightforward, it leaves out any ornamentation and focuses heavily on functionality. Cabinet doors are flat-panel shaker style, with joinery perfection. Craftsman cabinets display earthy metal hardware, such as brass or iron, and are masterfully constructed with quartersawn oak or other wood. Oak is most identified with Craftsman design; but if you should choose another wood, an indigenous species such as maple or pine would be appropriate. Like cabinetry, Craftsman kitchen lighting also is first and foremost about function. Drop, pendant or chandelier lighting is most preferred. Sconces and tiffany lamps are also favored. Craftsman kitchens often eliminate a separate table and chair set up and go for the built-in nook set up for cozy family meals. Colors of the Craftsman kitchen are muted earthy or neutral, as a Craftsman kitchen pulls straight from nature. Grays, creams, mossy greens, woodsy browns, rusty reds deep golds are introduced through paint, tile and accents. Honed granite or soapstone are favored for Craftsman countertops. Slate flooring and backsplashes are also a perfect choice. There is nothing shiny about a Craftsman kitchen design. All fixtures should have a warm, deep finish and may include patina. Tile is the major decorative element in a Craftsman kitchen where color and texture can “pop”. Hand-molded with rich details and painted, the tiles boast colorful appeal to backsplashes, countertops and islands. The range hood of a Craftsman kitchen is also a place to celebrate this unique design. A balance of light and dark patinas, contrasted with textured iron straps and rivets makes for an excellent choice for an added rustic element to your Craftsman kitchen! One step inside this humble little hub takes one back to simpler times of a carefree, happy lifestyle. A palette of soft colors, wood floors, vintage elements, open shelving, beadboard and colorful accents all contribute to this elegant simplistic style. 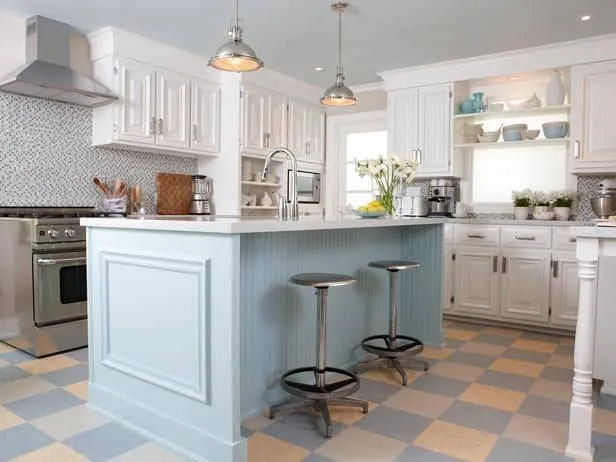 Beadboard is signature of a Cottage kitchen as this paneling creates the cozy cottage affect that makes this kitchen so special. The cottage palette is usually light and airy. Classic white for a crisp clean look or creamy ivory are usual top choices, however pale yellow, turquoise or oatmeal are also favored. Cabinets in this style could also have a distressed look, or mixing colors with one shade on the cabinets and another on the kitchen island adds more dimension. Open shelving is also popular in the Cottage kitchen. The openness gives the space a larger appearance and creates a striking effect. The farmhouse/apron-front sink again makes a strong presence in the Cottage kitchen. They create a sense of country living and are perfect for this design. Furniture-like features to lower cabinetry and kitchen island are also popular, as are cup pulls for hardware. Hardware finish with patina is an added touch. Pendant lighting, vintage sconces and lamps add to the cozy atmosphere of this charming kitchen design. GI Construction is a general contractor in Las Vegas that will help you design and build any kitchen that you wish to create. Our team of highly skilled professionals will guide you through every step of the kitchen remodeling process—from the design phase to finishing touches! We will build a kitchen that truly inspires you, and a kitchen that becomes the heart of the home for you and your family.